Today’s Memory Lane comes from both hubby’s and my history. The kids were getting cagey with the spitting rain so Meemaw and I chose to engage their minds in some games. I ended up having to play an active and physical roll as referee in a very intense game of Sorry. It made me remember hearing from Ben’s mom talk about sitting inbetween he and his younger brother with a leather belt in order to keep the game of Risk they were playing congenial. 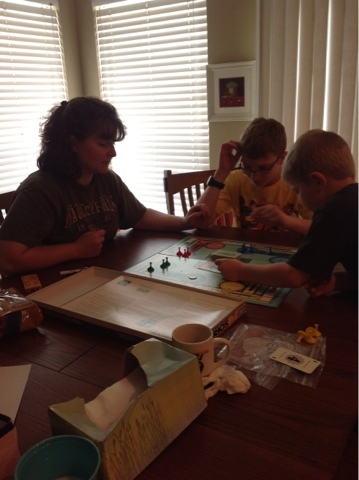 I also remember during Christmas Break from school, my younger sister and I had a Monopoly game that went on for days!! One of my favorite games growing up was Spoons. For this game you place one less spoon than players in the middle of the table. Combine at least 2 decks of playing cards, shuffle them, and deal 4 cards to each player. The dealer will lay the rest of the cards in front of them and pull one off one-by-one. As soon as you have four of a kind in your hand, you can grab a spoon. Once a person reaches for a spoon, you best grab for one cause at this point the spoons begin to fly!!! Fun! I miss those evenings in NC when we would play board games together.